Simple and fast password storage application. Is there a better alternative to myWallet? Is myWallet really the best app in Applications category? 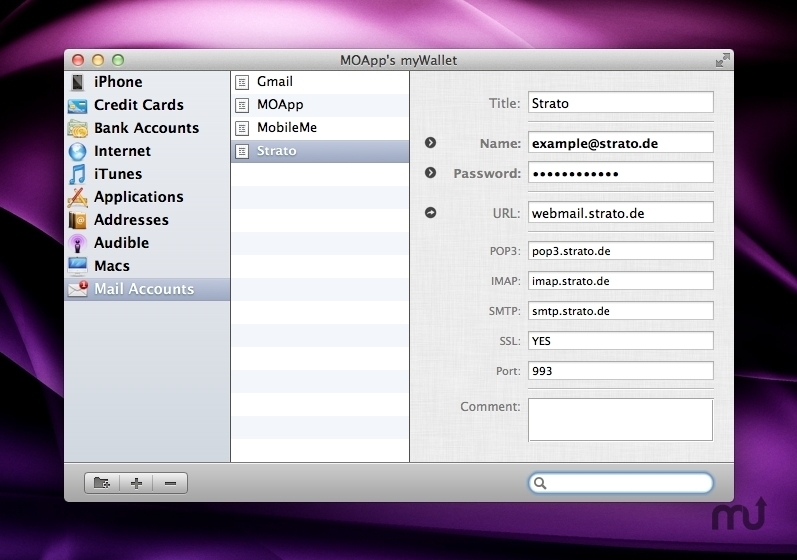 Will myWallet work good on macOS 10.13.4? myWallet ... Your cute digital wallet. With myWallet you manage all your important and sensitive information in a portable way and they are at your hand in a blink. Your data are password protected and securely encrypted; they are completely searchable and divisible in categories. For your convenience you are free to run myWallet from a thumb drive or you can keep it in sync by using iDisk or Dropbox. myWallet needs a review. Be the first to review this app and get the discussion started! Unlike many programs myWallet doesn't pretend to be everything for everyone. It is designed to do one job perfectly and as easy as possible. We all have more important things to do than to struggle with a program at the moment we badly need just a password or a credit card number.